We will also be rotating out a few old costumes so visit the in-game shop or web store here to see all the limited time items. Sale ends July 21, 2017. For the complete official rules, click here. We will also be rotating out a few old costumes so visit the in-game shop or web store here to see all the limited time items. Sale ends July 7, 2017. We will also be rotating out a few old costumes so visit the in-game shop or web store here to see all the limited time items. Sale ends June 23, 2017. For the next four weekends, enjoy a different in game boost to help you along your daevic journey. See our schedule below for the rotating boosts! Defend our capital cities from Ereskigal's Dredgion forces as for the first time the Balaur has broken through the Aetheric Field that has long protected our home. Challenge contenders, friend or foe, in the Arena of Tenacity and proclaim your self the victor. Continue to wage domainace in the Abyss against the opposing faction and Balaur, and strengthen your PVP stats with the all-new Marchutan or Kaisenel's Bracelet. Aion: 5.3 is now live. Click here to read the full patch notes and check out our trailer below! Hundreds of Omega Enchantment Stones are used daily in game. Soon, every enchantment you make with an Omega Enchantment Stone, regardless of success, will pool towards rewards for the entire community. Work together to unlock prizes like Luna, Manastones, and Bonus XP/Drop weekends! A survey containing 500 Untradeable Supplements will be given to all players for your endeavours. Similar to the Bonafide Bootlegs event, Mysterious Merchant Luxurinerk sells equipment and accessories for you to enchant and temper. All weapons and armor are pre-enchanted to level 10, and when enchanted to +15 will exchange for permanent gear. For those who want to push it further, armor and weapons enchanted to +18 or higher will exchange for a different, more powerful set. Accessories can also be purchased and tempered +5 or +7 for different equipment sets. “Rent” the equipment and accessories for the duration of the event, or enchant them to its required level! We will also be giving players supplements for this promotion! A new accessory item, the Empyrean Bracelet, is making its way to Atreia in Aion 5.3. This new accessory greatly improves your PvP Defense and slightly improves your PvP Attack, and can be leveled up through tempering similar to the Plume. At higher levels, its appearance changes and it will also gain up to 3 manastone slots. During the Tempered Power promotion (formerly known as Power of the Plumes), temper your Plumes and Bracelets for rewards! If you’re wondering when 5.3 is launching, keep an eye on our website for our announcements. The Broken Hearts event will also run starting next month. Full details for all Enchant-O-Rama events and promotions will be available as the event nears its start. Happy enchanting, Daevas! Please bear in mind what we discuss have already been a work in progress and not an exhaustive list of what the team has been doing. We will continue to share with you our plans, thoughts, and actions on the game. It’s AKAKAK time! New update, new items! Additional bonus entry scrolls are now on the store along with the new Shugo Ranger Power Suit! Run the new Archdaeva instances again and again with bonus entry scrolls! For two weeks, Arena of Glory Tickets are available for purchase. There's a weekly limit to purchases, so grab them while they last! Defend Atreia as a Shugo Ranger. In default red for males, and pink for females you can dye them any color if you want something different. Get the squad back together with these new emotes! Visit the in-game store or our web store here for all store items. Plumes can now be purified into Pure Plumes, you can explore the Luna Shop and all the services it offers, the Atreian Passport has been updated, and more! We also have the Power of the Plumes promotion for tempering your Pure Plume as high as you can. Follow this link for more details. This update has many more updates and addttions. View the patch notes here for full details on what’s new. Get these summer items while they're hot hot hot or discounted discounted discounted! For 99 NCoin, pick up a new swimsuit you've been dying to get and more. Sale ends August 10. Now that Aion: Echoes of Eternity has made its grand entrance, we will be adding the next update to the expansion in a few weeks’ time. This update includes additional quality of life changes, new quests in the new zones, changes to the plume accessory, the introduction of the Luna Shop, and more. For additional EXP, item gathering, or exploration opportunities, a series of daily, weekly, and party quests in Norsvold and Illuma will be introduced. 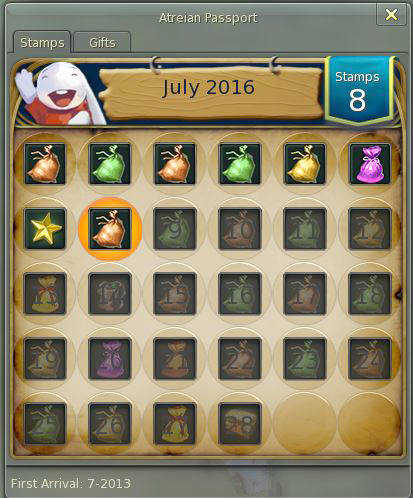 In this updated Atreian Passport you can now see which rewards are available each day. When you complete the month, you can acquire a Mythic Armor Box. The anniversary reward box will have updated items as well! Be sure to log into the game to collect these rewards. In this upcoming update, plumes will no longer explode or lose tempering levels if the plume fails to temper. You can temper your plume without it going boom! Also, if you have a +10 or above plume, you can visit the Equipment Purifier to purify your plume to the all-new Pure Plume. During the purification process, the tempering levels will be reset and the Pure Plume stats boosted. You will also select an additional stat for the Pure Plume. For a Magic Boost plume, you can purify it to add Magic Accuracy or Crit Spell. You can also temper the Pure Plume with Tempering Solutions to continue to boost the accessory’s HP and secondary stats. If the temper fails, the Pure Plume will not go boom, but its tempering level will be lost. The Luna Detachment, an independent organization of Shugos and Daevas, is making their way to Atreia and they will need your help. 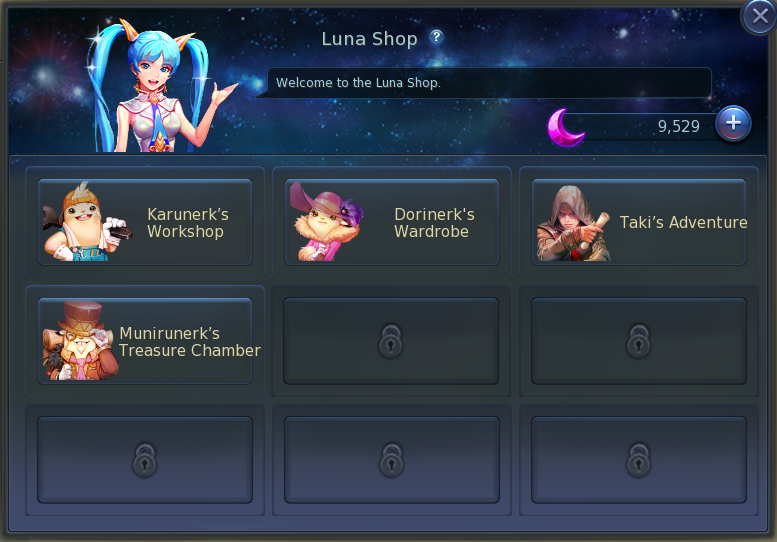 Soon you can visit the Luna Shop where you can exchange Luna, a new currency, for unique services from the shop. Services include accessing a mini wardrobe allowing you to register and reuse a skin multiple times, and collecting crafting materials from missions to create a variety of aesthetic items including skins and mounts. These highlights are just a few of what is to come in August 2016. Stay tuned for our release date and additional information these additions! Available via survery, collect your free [Untradeable] Plastic Surgery Ticket one per server, per account. Survey is available until Wednesday, July 20. Learn the truth about Archdaeva and the fateful day the Tower of Eternity shattered in our lore cinematic. Aion: Echoes of Eternity launches on July 13, 2016. Visit our teaser site for more information. Return to where it all began, the Tower of Eternity, and get ready for the journey you’ve been waiting for because Aion 5.0, Echoes of Eternity, is launching on July 13, 2016. Mark your calendars, set your alarms, you don’t want to miss this day! If you are new to Aion or just returned, our Homeward Bound event is a great place to start or catch up. Spring is officially here! The warmer weather also brings new outfits, dyes, and savings! Visit the Black Cloud Marketplace to see all of the items here. New on the Black Cloud Marketplace by popular demand and modeled by two of our very own, the Heartseeker Outift is now permanently available. Also permanently added to the Black Cloud Marketplace, the Moon Rabbit Picnic outfit is now available! The Romantic Purple Dye is here as a permanent addition to the Black Cloud Marketplace. All items in the dye category are 50% off for a limited time, until March 30, 2016. The Cute Rabbit Costume, Lovely Pink Rabbit Costume, and Classy Gray Rabbit costume are 50% off until March 30, 2016. The Harvest Saam Egg, Traveling Kitter Egg, Hungry Porgus Egg, Pinkhair Steren Egg are all 50% off until March 30, 2016. For a limited time, the Magnificent Clucklish is on sale for 50% off. Sale ends March 30, 2016. Along with the newest update to AIon: Upheaval, we're bringing some new and permanent items to the Black Cloud Marketplace! See just how deep the rabbit hole goes with these new costumes. Gain additional entries to both Infernal Danuar Reliquary and Infernal Illuminary Obelisk with these entry scrolls. Wrap and send Eternal, Mythic, or Fabeled weapons, armor, and accessories, now permanently in the store at a new lower price! Another permanent additions to the store, use these scrolls to retune your Mythic armor or weapons. Visit the Black Cloud Marketplace to take home all of these great items. Come one, come all, to the Upgrade Arcade! Try your luck by upgrading an on-screen weapon to the next level. At certain Upgrade Levels, you will unlock different prizes including Stigma Bundles, Aether Glider wings, and the all-new Quick Frillneck mount! Step right up! Don’t be shy – we’ll even give you a free try! Click Play to start the mini-game and you'll see the weapon on the screen change before you. Subsequently by clicking Play, you will continue to upgrade the weapon and the Upgrade Level. There is a chance to fail at each upgrade level so play wisely!If you want to claim your prize, click Reward and a random item from the tier's prize list will be placed in your inventory. Prestige Badge holders will receive an additional (2) Arcade Token via survey each week of the event. Rewards available include Mythic Drakenspire Depths weapon bundles (both Dark Lord's and Darken Lord's are available) that let you choose a weapon for your class. There's also the brand new Can Costume and Can Hat. Try your luck at the Upgrade Arcade! Mini-game ends March 2, 2016. Valentine's Day is almost here! Celebrate with special Pureheart and Heartseeker weapons on sale for a limited time. Show your enemies your sweet side with these festive white chocolate weapons. If dark chocolate is your flavor, the Heartseeker weapons will satisfy your sweet tooth while bringing the pain to your enemies. Click here to visit the Black Cloud Marketplace. Sale ends February 17, 2016. Starting today, January 15, 2016 until January 27, 2016, we're doubling the item drop rate! Log on starting at 6:00 pm CST to start earning double the drops and fill your inventory! Event starts at 6:00 pm CST (server time) on January 15, 2016 and ends with the maintenance on January 27, 2016. This event will stack with drop boost items. This event does not affect event drops. Log in to collect your free bonus items and start collecting double item drops today!